A business or commercial lease agreement must be terminated according to law to ensure that the rights of both parties are extinguished fully. 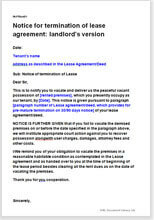 If you are a landlord, use a comprehsnive document as this to protect your interests. This is a simple document to terminate a lease agreement of any commercial property. Complete with explanatory guidance notes. Condition of the premises at time of vacation.